"This is a great summertime drink, lots of ice, a tall glass and a big ol' lounge chair. Mmmmmmmm!" Fill a tall glass with ice. Pour in vodka. 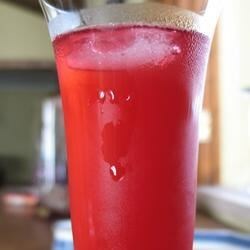 Fill glass to 3/4 full with cranberry juice. Top with orange juice. Stir. Also known as a madras - yummy! Very easy to make! I usually add more OJ though. Tastes good! My husband and I are sitting here drinking our first Red Rooster right now. Absolutely WONDERFUL!!! Thanks for a great recipe!!! YUMMY! We drank these right up, thanks! Careful if drinking these on a lounge chair. Very tasty but i didnt measure and could hardly get up. Will make again though- so good! Refreshing and good. Not at all too tart. Used unsweetened CJ and i thought it was great.